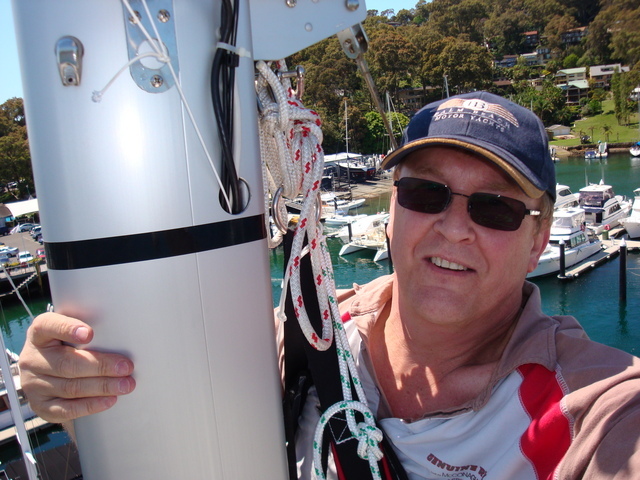 The following article first appeared on the Jeanneau Owners Forum and has been reproduced here by kind permission of the author. 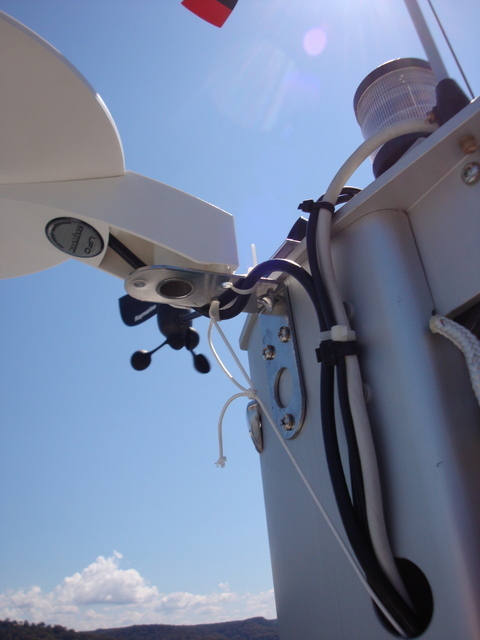 I tried to find some information on TV antenna installations for our yacht but couldn't find much so I hope this may help someone who is contemplating doing the same. I purchased a small antenna designed for a Yacht or camper van. I also purchase a stainless steel bracket to mount the antenna up the mast and 20 metres of Belden RG6 75 ohm coaxial cable. Carefully going through the sequence of events prior to being hoisted up the mast saved forgetting anything. I needed a battery drill with bits, three self tapping screws, cable ties, side cutters, a string line with a sinker on the end, a marking pen and a screwdriver. I filled the pocket on the side of the bosun's chair with tools and also attached a bag to hold the battery drill. 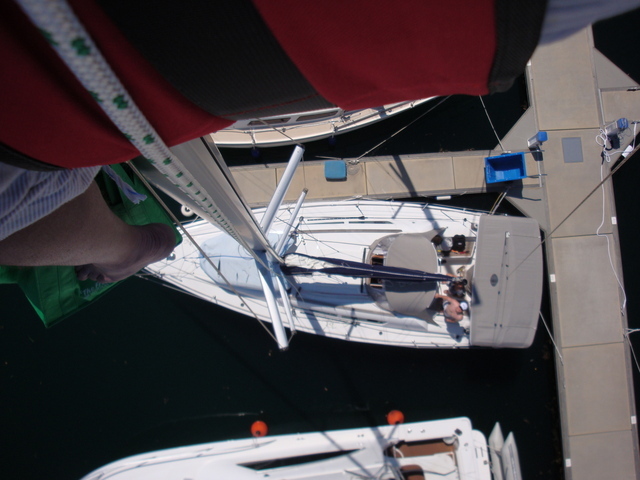 The main halyard and the topping lift (main and emergency) were attached to the bosun's chair and up I went with lovely wife and big strong son on the winches. All tools had strings attached so I could wrap them around my wrist to prevent dropping them from aloft. For advice on safety when going aloft you can refer to the excellent Selden Mast "Hints and Advices" booklet - see page 60. It really is worth a read. The hole locations for the antenna mounting bracket were marked, and the holes drilled. 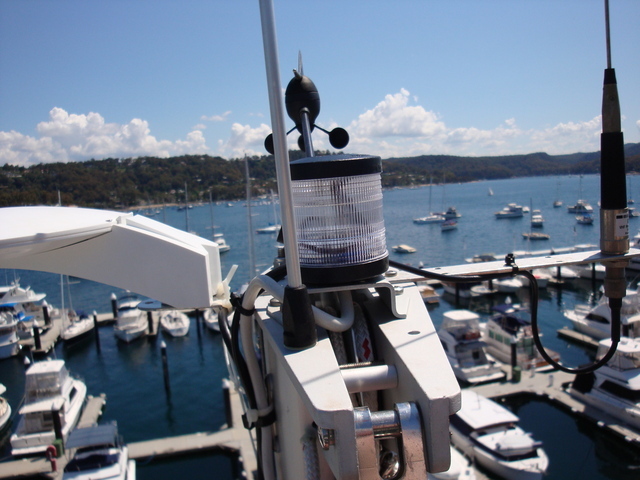 Then the bracket with the antenna attached was mounted onto the side of the mast. The stainless bracket was lacquered earlier to insulate the stainless bracket from the mast to stop dissimilar metals connection over the complete area of the bracket. The string line with the sinker was dropped through the hole shown in the photo, and drawn out through the bottom of the mast. Next the coaxial cable connected to the antenna is connected to the string line and dragged through. Before this the coaxial cable was polished with Teflon lubricant for the entire length to reduce friction when being drawn through the mast. The cable ties were use to take the weight of the cable and the ends trimmed off. The cable was drawn out of the bottom of the mast. Next the string line with the sinker was dropped through the pipe at the base of the mast through the cabin top and drawn out below floor level in the cabin. The cable was attached and drawn through. The cable is attached to the power and splitter unit with an "F" connector which was mounted under the saloon dining seat on the front cabin bulkhead. Power was fed from the "Aux" connection at the power distribution panel and switched on. With power applied to the mast head amplifier I could see for the first time good TV pictures on my mooring. I was glad when the work aloft was finished as I found it quite demanding doing the work up there. We are very happy with the result as if we want we can now watch TV on the mooring. I hope this may give someone the confidence to do the same if they wish.